Boca Ciega Resort ist ein vierstöckiges Gebäude, gebaut in den Jahren 2005-2006 in der Bucht von Long Bayou in der Nähe von Madeira Beach FL. Diese 1 Schlafzimmer, 1 Bad Wohnung wurde im letzten Jahr komplett renoviert und ist atemberaubend. Es liegt in einer sicheren Wohngegend in der Nähe aller Strände und St. Petersburg / Tampa, FL. Das Boca Ciega Resort liegt nur wenige Gehminuten von einigen der beliebtesten Restaurants in der Umgebung entfernt. Es ist auch nur wenige Autominuten von einigen der beliebtesten Strände in Florida. Schöne Aussicht auf das Wasser. Voll ausgestattete Küche, große Waschmaschine und Trockner. Ein großer beheizter Pool mit vielen Liegen und einem wirklich schönen Whirlpool. Ein Angelpier, wo Sie Ihr Boot für eine Stunde parken, entspannen oder die Delfine und Sonnenuntergänge genießen können. 2 Aufzüge, BBQ-Bereich, ein Dock zum Angeln, kostenlose Parkplätze, kostenloses WLAN am Pool, einen Fitnessraum und vieles mehr! Sehr sichere und saubere Anlage. Es ist definitiv ein Stück Paradies. The condo was perfect. It was exactly as pictured. It had the most beautiful sunsets to view from the balcony. Mary, the owner, was terrific to work with. She answered all my questions and gave me some suggestions on places to visit. I loved every minute of being there. The condo was perfect for the two of us. Mary met us at the condo and showed us how everything worked (i.e. lights, tv). She had even left things in the pantry. 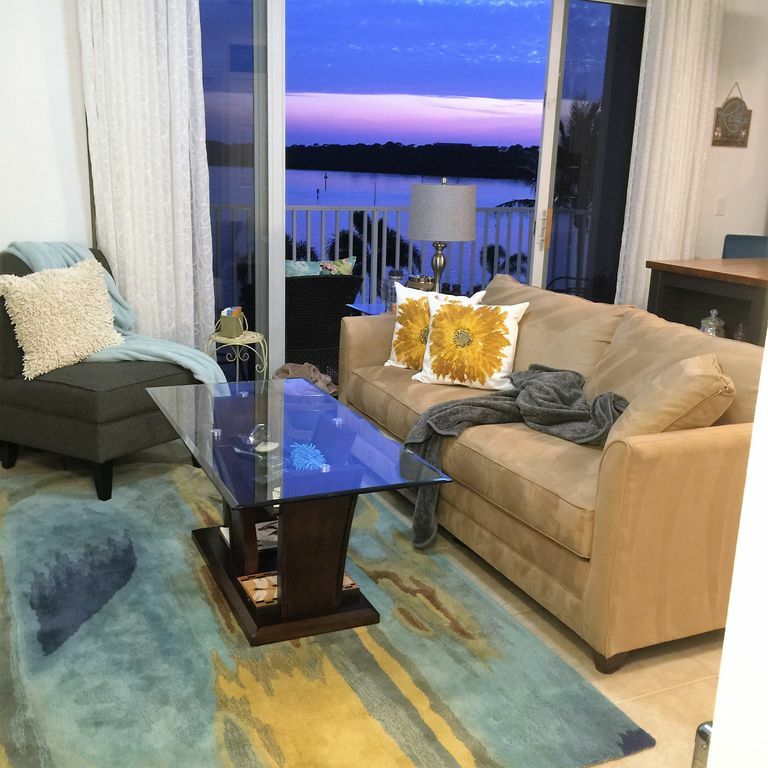 The condo’s location is great for shopping, groceries, and yes Hubbards Marina – dolphin watch. On to the best part…the sunsets are beautiful and watching the dolphins from the large balcony overlooking the bay were unforgettable sights to see. We hope to return someday soon. Our stay at Boca Ciega resort was one of the best ever in Florida. It is convenient to lots of shopping and good restaurants. The unit was well maintained and clean and had enough room for the two of us. It would have been nice in the afternoon to have an umbrella on the balcony to block some of the sun. It got really hot in the afternoon and evening on the balcony and in the living room, although that's what we were there for. Thank you so much, Mary, for renting to us. Great condo with beautiful sunsets! We had a wonderful family vacation at this condo. The owners were really helpful and easy to reach if necessary. There was plenty of space for 2 adults and 2 small children. The resort is centrally located and everything was nearby including multiple beaches. The condo itself was very clean, well decorated, and provided us with all the things we needed. The facilities were well taken care of, including the heated pool & hot tub, The sunset view from the balcony was beautiful! We really enjoyed our stay! It was a pleasure having you. I love this place and love sharing it: I hope you visit again. Hidden Gem near Madeira beach! If you enjoy breathtaking views while enjoying your morning coffee then this place is for you. Mary was an excellent host and was available to answer all our questions. It is evident that they take pride in their unit. The house was immaculately clean and well appointed. For being a smaller unit it was extremely well laid out and decorated. Storage everywhere! Balcony had ample seating and loungers. My six year old loved the heated pool and we loved the hot tub and spacious pool deck. Pool was warm enough to swim Christmas week. Great little private dock for fishing, crabbing, or kayak. We are a family of three and it slept us comfortably, probably not enough space for more than a family of four. Extremely close to all the local eateries, John’s Pass and target and Walmart. Also close is a Wawa...great coffee and gas that’s the same price cash or credit. This is the best one bedroom unit in Boca Chiefs!!!! We plan on coming back as soon as we can. Thank you Mary!